The Galaxy M20 is the more premium of the two M series smartphones recently unveiled by Samsung. Both the Galaxy M10 and the Galaxy M20 were release to go head to head with Xiaomi's budget range Redmi smartphones. The M20 sports a 6.3-inch IPS LCD display with a resolution of 2340x1080px and a waterdrop notch which houses the front facing camera. The phone is powered by Samsung's 14nm Exynos 7904 chipset with 4 Cortex-A73 CPU clocked at 1.8GHZ and 4 Cortex-A53 CPU also clocked at 1.8GHZ. The phone has a dual rear camera setup with a primary 13MP f/1.9 lens and a secondary 5MP f/2.2 ultra-wide angle lens. It packs a massive 5,000mAh battery and a 15W fast charge support (which is included in the box). 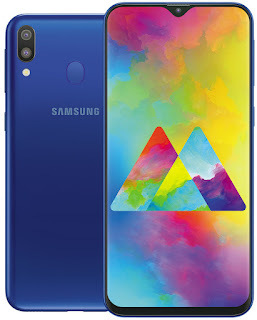 The Samsung Galaxy M20 is available in 3GB RAM/32GB internal storage configuration as well as 4GB RAM and 64GB RAM option. The phone has dual SIM SIM card slot with a dedicated SDcard slot. It also has a headphone jack and runs on Android 8.1 Oreo with Samsung Experience 9.5 out of the box. The M20 will go on sale starting from the 5th of February at $180 ( INR 11,000 (€135) for the 3/32GB Model while the 4/64GB model will go for $200 ( INR 8,000 (€100). It's available in Ocean Blue and Charcoal Black color option.